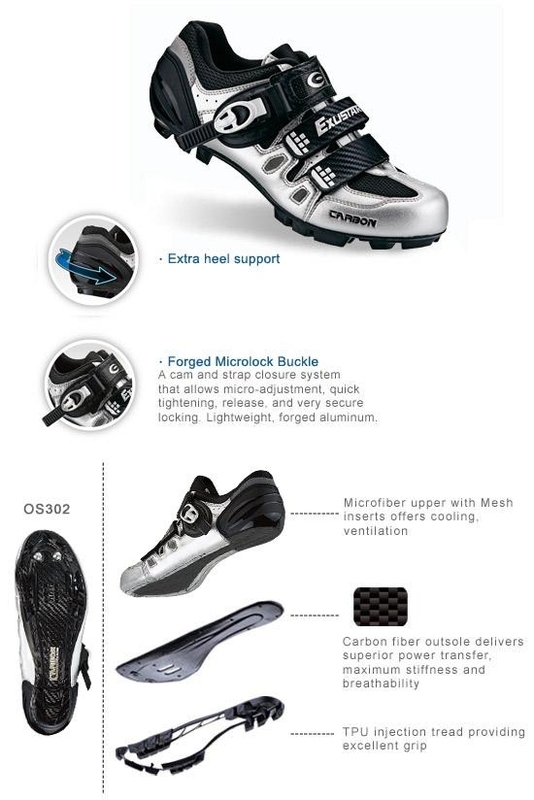 The Exustar SM322 Carbon MTB Shoe is our top of the line mountain biking shoe, built for the rider who demands high performance gear to keep up with their serious riding style. Built of lightweight components that are very stiff, this shoe is designed to transfer as much power to the pedal as possible. The upper is constructed from a synthetic microfiber leather with breathable mesh side panels and reflective material and features a molded heel cup. The breathable mesh keeps your feet cool, while the reflective material provides additional safety when riding at night or a dusk. The molded heel cup adds support and helps hold down your heel during the pedal stroke. A forged Microlock ratcheting buckle provides the first layer of retention, with two Trihook straps below that that offer secondary tightening without creating painful pressure points. These two together provide quick tightening, quick release, micro-adjustment and very secure locking. Once you’ve put your foot in, it’s not coming out without you wanting it to. Adjusting on the fly is a snap, and the shoe will come off quickly when it’s time to wear something else. This buckle system is far superior to traditional laces. The insole is a washable, Dupont Engage EVA. A little time in the wash and these shoes will smell great even after months of riding. The sole is a super stiff carbon fiber with injection TPU thread. Carbon fiber provides stiffness while keeping the shoe light. 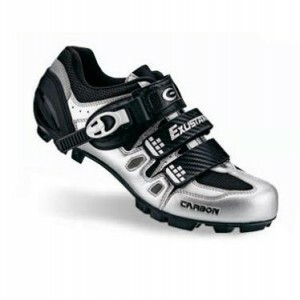 The sole of this mtb shoe features threaded inserts for toe spikes, and is compatible with Shimano SPD cleats. The tread on the sole offers base level traction, but you have the option to add cleats if you wish. For example, if you find yourself riding in wet, muddy conditions, the spikes will come in handy. This mtb shoe offers superior durability, first-class performance and a great fit. A stiff cycling shoe that will transfer maximum power to the pedal, keep your feet comfortable, and stay well-ventilated. Whether you’re a serious racer, a spin class hero or a weekend warrior, this is one shoe you can’t miss. Crikey! Is that an Australia Team Cycling Jersey? Aussies know cycling, the 2014 Glasgow Commonwealth Games recently wrapped, with Australia finishing in the top tier with 20 medals, 7 of them gold! 9 Australians have won the Tour de France, with the most recent being 2011’s Cadel Evans and 2013’s Simon Gerrans. The great southern land is home to dozens of off-road trail rides, all over the continent-country, from the 613 Km Oodnadatta Track in South Australia to the 1146 km Great Central Road through Western Australia and the Northern Territory. In fact, Cycle Australia lists 20 rides through the Australian wilderness, encouraging mountain bikers to explore the vast wilderness and wide open spaces. For even more exploration, Cycling Tours of Australia and New Zealand can set you up with guided tours to make for the ultimate cycling getaway. With so many options for your cycling adventure in the land down under, you want to ride in style, right? 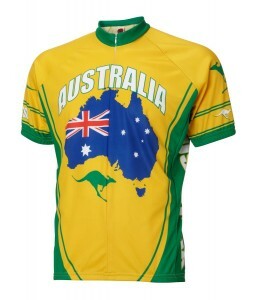 Well ride in style and show off your Aussie pride with the Ecyclingstore World Jerseys Australia Team Cycling Jersey. Made from 100% Polyester DrySport wicking fabric, the Australian Team Bicycle Jersey is the perfect choice for breaking a sweat in the hot Australian sun (or, wherever you ride). Sporting the shape of the Australian continent and the flag’s colors as well, this jersey is a perfect representation of the country’s pride! Get one and your mates will say “good onya.” Dinky-di!